2 What constitutes internal traffic? 3 How do we exclude this traffic? While this may make your figures look impressive, it doesn’t really help. We need the data to be as precise as possible. Precise accurate data = the most informed position = the right decisions being made, excluding internal traffic is the best way to get a true representation of the level of traffic you are receiving. Internal traffic is basically anyone who uses your website and works for your organisation. This could be anyone from the development team, to accessing a login to an internal intranet. How do we exclude this traffic? excluding a range of IP addresses. The option you choose will depend on your set up. If you are an individual working at home on a personal blog (like this one), then you will only need to exclude a single IP. However, if you are a large organisation, you may need to look at excluding a range of IPs. If you had to guess already, this method blocks traffic from appearing in Google Analytics if it originates from a set or range of IP addresses. If you only have one IP address to worry about, go to the Admin Section of Google Analytics in the top navigation and select the All Filters Tab in the account settings. You can use either a predefined filter or a custom filter. In this example, I will show you how to use a predefined filter, and, in the next example, show you a customer filter. Select the new website view that we created earlier. 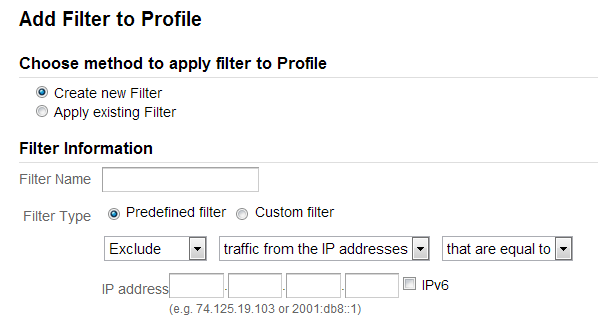 Here we will be creating a custom filter to exclude a range of IP addresses. Go to the Admin Section of Google Analytics, select the Filters Tab, and select New Filter. Now select ‘Create new Filter’ Filter Type: Custom Filter Exclude Filter Field: IP Address Filter Pattern: Input your IP Address Range. To exclude traffic from a range of IP addresses, use a regular expression. For example, from 63.212.171.1 to 63.212.171.9. Enter 63\.212\.171\. [1-9] into the ‘Filter Pattern’ field. That’s all there is to it. Very easy, but very beneficial.